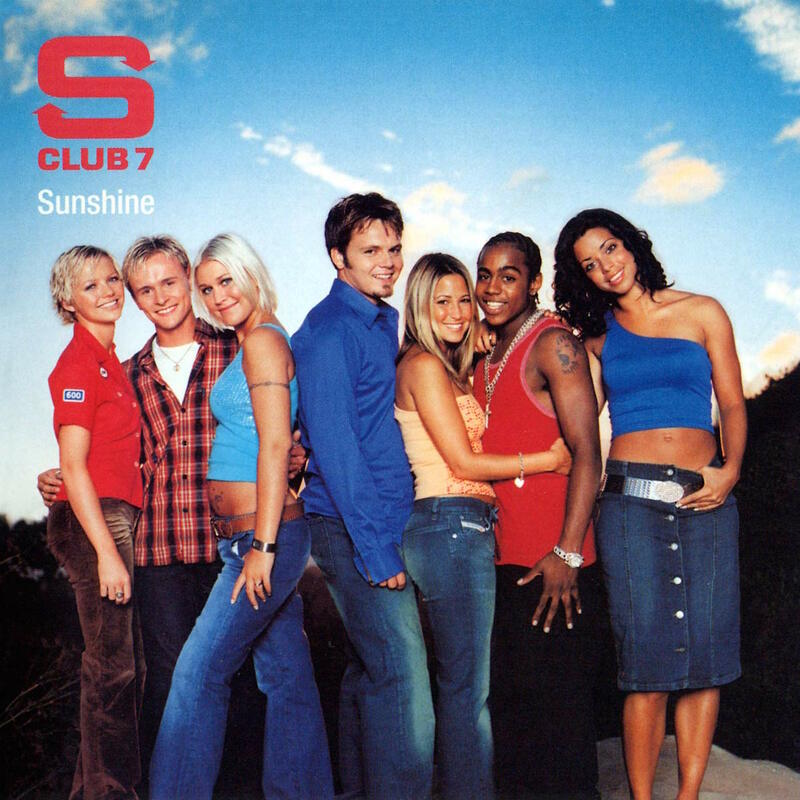 Today’s POP RESCUE is the 2001 third S Club 7 album, Sunshine. This 15 track opens with the lead single and huge hit Don’t Stop Movin’, a song that has probably become their best known song. This song is infectiously catchy, and there is no option other than to sing along. It was no doubt aided by a great video, and a truck-load of perfect remixes. It nods respectfully to robotic vocals, and also back to disco. Second track, Show Me Your Colours, is a softer, more gentle track, with some wonderful vocal solos and harmonies throughout, sent against strings, acoustic guitars. Like Don’t Stop Movin’ everyone seems to get a turn on the vocals. A 50s feeling bursts in with the album’s third and final single – You, and this lends it some pace that carries it through as quite a catchy, bouncy, little pop song. The video also works fairly well, retaining the 50’s style with a look at the future. This was the final single for member Paul Cattermole. Second single Have You Ever is up next and this is classic S Club ballad territory. It’s unsuprising therefore to find that it is a co-write between long-term writing, musician, and production collaborator Cathy Dennis (the first of her six co-writer credits on this album). Fifth track, Good Times, is up next, which has an almost Motown feeling to it. It’s quite a nice mellow track, and it’s a nice song, but it’s definitely an album track only. This is followed by a RnB toned track called Boy Like You, which reminds me as a cross between something by En Vogue and Billie Piper. It has a lovely bass line, and obligatory S Club key change. The title track Sunshine is up next. It’s a light, mellow, track, which *I think* is sung mostly by Jon. It feels pretty summery, but isn’t particularly memorable. Dance, Dance, Dance is a pumping, funky, companion to the opening track Don’t Stop Movin’. It’s almost a Part II, although the lyrics aren’t quite as catchy, but it definitely takes the disco theme and robotic vocals a bit further. Next up is It’s Alright which bounces in like a Sonia album track. This is S Club delivering their ‘motivational’ songs. This is followed by dance track Stronger, and to be honest, Tina is on lead vocals here but her vocals are ironically, not very strong. Musically, it’s quite a nice track, and it’s quite catchy in the chorus when the rest of the group join in with the vocals, but those vocals just aren’t working for me. Spanish guitar and RnB beats open the next song, Right Guy, a co-write between S Clubber Bradley McIntosh and Cathy Dennis. I could definitely imagine this song being a Blue or Craig David song – both of which were enjoying chart success at the time. Bradley even ends up doing some rapping. This definitely feels like a prelude to what could have been Bradley’s own solo career (although he went on to write and produce for the likes of JLS and Mutya Buena). Track twelve is Summertime Feeling, which subtly and perfectly samples Fleetwood Mac‘s track Everywhere. For some, this may feel like sacrilege but the use of the sample isn’t the main focus of the song. It is used in the chorus, but it is joined by some bass and vocal harmonies. This track is definitely a summer song – and had Paul not quit when he did, then this may well have become another hit single. I Will Find You is up next, and this is another mellow RnB tinged track, and unsurprisingly also another Bradley co-write. It’s fairly catchy, but was definitely not single territory. Again, this could easily have been something from a Bradley solo career had he have picked one up. Up next is their huge 2000 Children In Need single, Never Had A Dream Come True. Oddly, their previous album 7 (from the previous year) was re-issued to also include it. It’s inclusion here though is welcome, as I really quite like this slow ballad. I even admit to having single-handedly sung this song for karaoke in a bar once. It thankfully didn’t clear it. The final track, a bonus one no less, is one of the great remixes of the opening track – Don’t Stop Movin’ (Jewels & Stone Radio Mix). This adds a more dance feeling to the song, pumping it up only slightly more, and giving it a great bit of guitar sampling. Tucked away on this edition of the album is a live version of Never Had A Dream Come True taken from S Club Party Live (a VHS/DVD release). I don’t think that this album breaks any new territory, and its redeeming feature is that huge opening song. The downside of the album is its length. Had this have been a 10/11 track album, it would have been a little more cherry-picked, and therefore not contain some of the still good but not exactly inspiring tracks. There are some clear winners, and some clear fillers here. Where are S Club 7 now? Paul Cattermole quit S Club 7 during this album, which may have led to Stronger, Show Me Your Colours, and Summertime Feeling being dropped as singles. After this, the group, as a six-piece released Seeing Double in 2002, as well as a feature film of the same name, and continued with their final TV series. They also helped to usher in the moderately successful S Club Juniors – an attempt to extend the S Club brand. After a disappointing performance of Seeing Double (it reached #17 in the UK), and a bit of a media backlash, the group’s chart success run was over. Jo O’Meara and Rachel Stevens both found some success with solo careers, whilst Hannah Spearritt found success as an actress in ITV’s Primeval series. Tina Barrett, who had previously worked with an early incarnation of Mis-Teeq, was reported to have recorded her own solo material, but this has yet to appear. Jon Lee found success in numerous roles in theatre in London’s West End. The group (including Cattermole) reunited in 2014 for a performance on Children In Need – performing a medley of hits on live TV. They announced a reunion tour Bring It All Back, starting in May 2015. 2001 UK CHART POSITION: #3, certified 2x Platinum. Posted in 2000s, Cathy Dennis, Rachel Stevens, S Club 7Tagged 2001, album, Bradley McIntosh, Children In Need, Don't Stop Movin', Everywhere, Fleetwood Mac, Have You Ever, Jo O'Meara, Never Had A Dream Come True, Rachel Stevens, review, S Club, YouBookmark the permalink.